One of my ultimate dreams when I go travelling abroad is to get invited by a local to their home for a good old traditional home cooked meal. Little did I know that my dream would happen happen right here, it would take place in the lovely home of Jean-Louis and Eve Fresnel. I first met Jean-Louis at Cafe de Paris, his restaurant that has closed. In spite of this very sad circumstance, we have kept in touch and dined out regularly. He has now ventured into importing 'luxurious' food from all around Europe. One of our favorite topics of conversation is about food and he always promised that he would one day invite us over at their place and whip up an authentic home cooked French meal. One of my strong suits is my sense of smell, I tend to notice and remember a specific smell of a certain place. I've been to different kitchens of restaurants and homes, when I got whiff of what's cooking in the Fresnel's kitchen, it was my first time to encounter that kind of smell. It had an aroma of herbs, cheese and bread which was totally different from the smell of condiments and ginisang bawang at sibuyas in local homes. On both occasions that we've been there, we got to try countless numbers of starters and appetizers. Most of the food items were part of what Jean-Louis brings in thru www.bowtieduck.com. Delicious fatty bite-sizes pieces of Sausages, Jean-Louis would usually carry a whole pack of these around even when we dine out. Jambon or dried ham, it's like the Spanish Jamon Serrrano and Jamon Iberrico. I've tasted both Iberico and Serrano hams before, these melt in you mouth treats were less salty and had more of the smokey flavor. Sologne Caviar. If I remember it right these type of fish eggs comes from the sturgeon fish, briny and taste of the sea. It was perfect with a glass of fruity Sauv Blanc. Tasty Blood Sausages were served with crostini. The sausages had a rich mineraly flavor. I've eaten black truffles before but I haven't seen the whole thing until that night. Jean-Louis made some creamy scrambled eggs on toast and put chopped black truffles on top. A French meal would always have cheese on the table. We got to try some French Blue Cheese, the cheese was so easy to eat, it had the right balance of sweetness and saltiness. Plus, it wasn't too strong and tarty compared to the locally known Roquefort french brand. We ate the cheese with some lightly dressed lettuce and baguette. For our entrees, the first time around Jean-Louis cooked some Pasta with Salmon in Cream Sauce topped with Salmon Roe. As Eve would say, Jean-Louis doesn't like people hanging around the kitchen while he is cooking. But he was kind enough to allow me to watch and ask him as he prepared and cooked the main dishes. The pasta dish was divine! The dill complimented the salmon and cream sauce really well. The salmon roe was perfect to complete the perfect bite. I felt that Jean-Louis intentionally under seasoned the cream sauce to accommodate the briny flavor of the salmon roe. The French rose wine he picked paired excellently with the dish as it was dry and it had hints of citrus. I couldn't get enough of this, luckily for me there was enough to have a second helping. The next main was a dish that Eve mentioned in one of our dinners, it's one of the French dishes that she misses, The Tartiflette. The baked dish consists of stir fried chopped potatoes and onions topped with Reblochon cheese. The one we ate had smoked salmon and Jean-Louis said that another variety would have bacon in it. The Reblochon is a semi soft cheese that's denser than a Brie and is tastier and richer in flavor. It's the only type of cheese that the French use in making Tartiflette. The potato dish was wonderfully rich, heavy and cheesy. As we were enjoying spoonfulls , they would share stories about the Tartiflette. It turns out that this dish is usually eaten during the cold winter months in France. Eve would recall that she and her whole family would stay in front of their fireplace eating Tartiflette every Christmas mornings. The desserts were also such a treat, I enjoyed the Fruit Creme Brulee and the Apple Mousse. It was a refreshing fruity way of ending the meals, just the way I liked it. 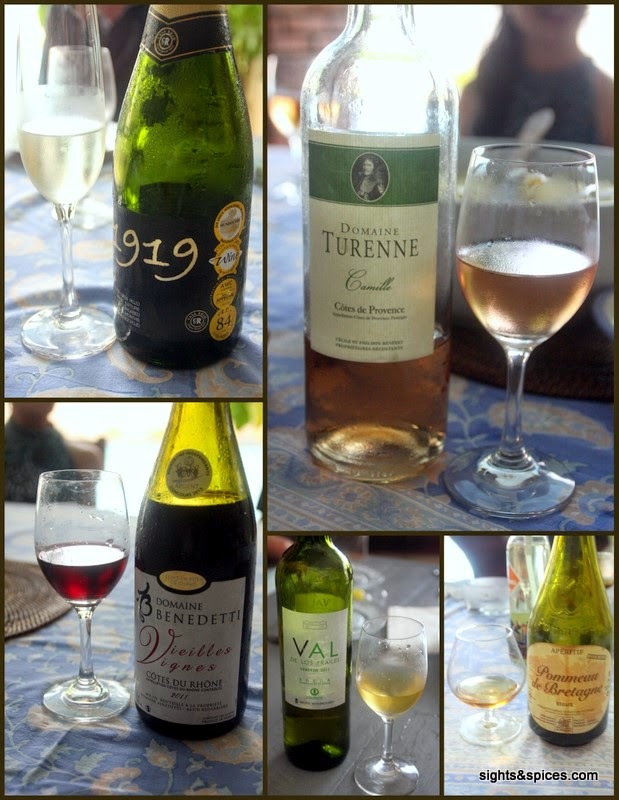 Of course a French meal wouldn't be complete without wines, we had countless number of good wines on both occasions (I lost count on how many bottles we consumed). 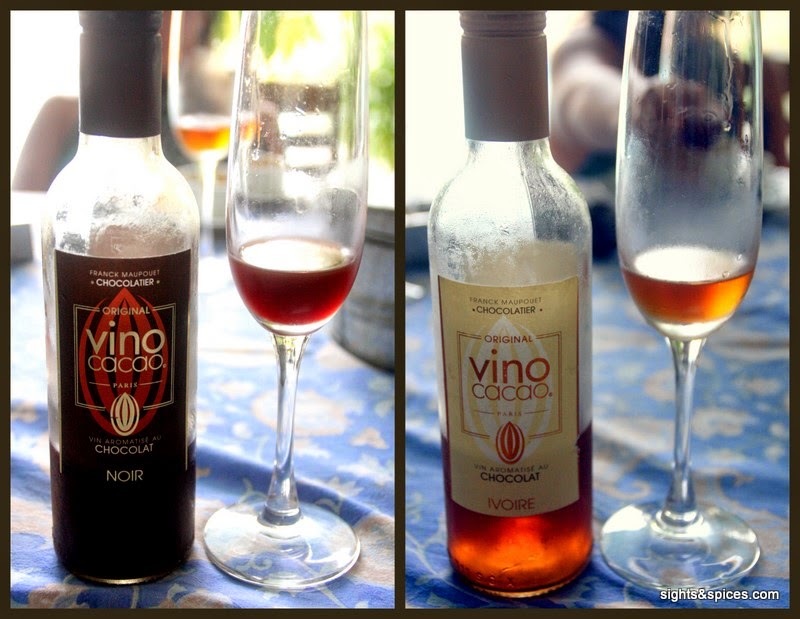 The memorable ones are the vintage 90's French yellow wine (forgot to take a picture of it) and the French chocolate dessert wine. It was such an unforgettable experience. From the bottom of my heart, I would like to thank Jean-Louis and Eve for making one of my dreams come true. I've eaten at top restaurants this year but the meals at the Fresnels top my list. It wasn't just great tasting food, it was also filled with great company and awesome conversation. Jean-Louis and Eve, Thank You Very Much and see you soon! Afternote: Eve is currently teaching French in an International school and she also does private tutoring. If you want to learn French, you can contact me and I'll forward her email to you. Being the only restaurant in a row of business enterprises, I didn't have any expectations of this place. I thought this would just be another run of the mill restaurant. I practically pass by here everyday as it is located in Shaw Blvd, Manadaluyong. And it was not until I read something about this place that we decided to give it a try. Restaurant was relatively small, seats around 20 people. Looking at the menu, all of the dishes they serve were Italian and it was such a joy to see that they serve wine. We got a bottle of wine from Sicily, a Nero D Avola that was made by Cellaro. It was my first time to taste this wine variety. Smell was slightly fruity and flavor was slightly dry with soft to medium tannins. What I found amazing is that for a small restaurant, the wines are in a separate refrigerator. The red was brought out chilled to the perfect temperature and prices were so cheap. It's a sign that the owner is a serious wine drinker and lover. We got to try two of the pasta dishes, the first of which is the Gamberetti Fra Diavolo. The Linguine was cooked to al dente perfection, shrimps were plump and juicy and the sauce was simple and flavorful. The pasta dish was so easy to eat that it made us take one forkful after another. The last main we tried was the Crusted Fish with Mushroom Risotto. Really simple dish cooked well. The crusted dory was lightly coated and it had a pretty nice crunch. I would have like my risotto a little bit creamier but flavor wise it was spot on. Not the best risotto but it was way way better and affordable than the other ones I tried around the metro. I read about people raving about Cantina's Cannolli and we were so lucky that we got the very last piece of the day. The server told us that usually the chef would just make a single batch for each day. We had the Dolci Combo which includes a cup of Cafe Americano and a Cannoli. The coffee they used was locally grown Arabica beans from Benguet, one of my favorite local coffee bean region. . The cannolli was love at first bite, the Italian pastry dessert was to die for. The pastry dough was thick and baked to a perfect crisp and the cream cheese filling had the right balance of sweetness and sourness, it even had pistachio bits in it. While finishing up our cup of coffee, we had a really nice conversation with owner and chef, Mark Buhain. I told him that I really enjoyed the meal, ingredients were of great quality and prices were so affordable. The whole experience was like eating a delicious and lovely home cooked meal. It wasn't anything fancy, really simple, honest to goodness food. I was recently invited to an event that was hosted by Nestle Coffeemate. Since the venue was just a few a blocks away from where I live, I decided to attend and checked the event out. The event entitled Coffeemate University Be Your Own Barista was held at CO/OP Cafe and Restaurant. After registration, I went inside holding my own personalized apron and a cup of coffee. As soon as I sat down and saw what's on the table, I had an inkling on what's going to take place. On the table was empty cups, a jar of coffee, bowls with syrup, a handheld frother, a thermos of hot water,a recipe book and of course Nestle Coffeemate. The program started with a short presentation of the new and improved Coffemate and proceeded to the introduction of tthree Baristas who were also part of the TVC. Each of them cited their credentials and shared their own coffee stories. It proceeded to the live demo of preparing two coffee concoctions made by the two pretty professional Baristas. The first of which is the basic Cafe Latte and the more complex Yin Yang, a drink that consist of coffee and tea. Both coffee concoctions were made using instant coffee and Coffeemate, it looked so easy to do. Now for the fun part, it was time to get our hands dirty. We were asked to re-create the Coffee Latte and add our own personalize twist. The recipe book that was filled with so much coffee concoction recipes was a big help to those who want to get it right on the dot. I went freestyle like I always do and what surprised me the most is that I got a decent froth from whisking Coffemate with water. I even drew and cut out my own stencil for some added coffee art. Here's what I came up with, doesn't look bad eh? Looks pretty good to me. By the way, CD stands for Coffee Day. After creating our own respective Caffe Latte-s, it was time for the group challenge. Each table was asked to prepare and present a cold coffee-Coffeemate concoction. With the help of the Baristas, each table came up with their respective cold creations to pit up against each other. My group mates prepared our drink while I was task to present it to everyone. Though we didn't win the challenge, it was fun to see the ideas and creativity of each group. Lunch followed after the judges went around and tasted each group's drink. CO/OP prepared a special Salad, Pasta, Sandwich and Chips platter for the event. I enjoyed the salad the most, it consist of slivers of pears, lettuce, grapes, crumbles of blue cheese and candied walnut doused with a balsamic vinaigrette. For dessert, each of us had a S'mores Cupcake. The event ended with the announcement of winners for the challenges. It was a fun-filled activity, everybody had smiles on their faces as we left the venue. I must say that I'm a big coffee drinker, I usually go through three to four cups a day. At home, I would always start my day with a cup of brewed strong black coffee. It's in the office that I usually have my instant coffee with Coffeemate. Though I prefer my caffeine fix, straight black and brewed, I commend the team behind Nestle Coffeemate. After the event, no one can ever say that coffee with creamer is boring anymore, Coffeemate has proven it's more than just your ordinary creamer.